/ East India / A Perfect Weekend Getaway Just A Few Hours Drive From Delhi! 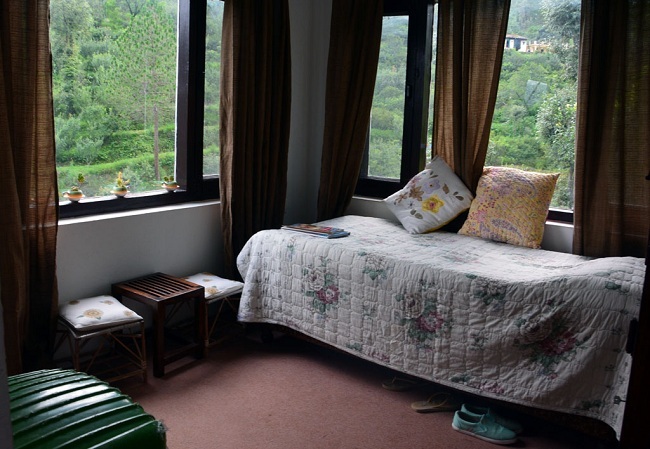 A Perfect Weekend Getaway Just A Few Hours Drive From Delhi! As drops of rain fall on the ground, on the leaves and on the slate roofs, we sit in a cozy balcony of our cottage sipping hot tea. We are surrounded by forest all around with a few village houses in the vicinity. Just a few moments before the golden rays of setting sun had engulfed the whole valley creating dramatic patterns on the sky together with clouds. Just 8 hrs drive from Delhi takes you to this tiny village Nathuakhan. 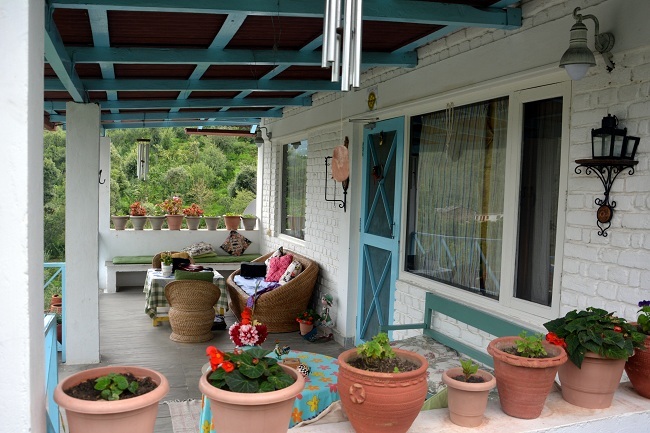 It is a quiet place located at an altitude of 1940mt in Kumaon range of the central Himalayas. Just a kilometer before the market of Nathuakhan is a beautiful cottage that we had booked to spend a weekend in the lap of nature. The drive from Delhi was enjoyable. We got to experience it all… sunny sky, clouds, rain, fog and again sun. The moment we entered the place we were sure we are going to have great time. There was warmth in everything. Ever-smiling staff to take care of every little thing; tastefully done interiors, nick-knacks placed in the outdoors; the cozy sitting areas inside and outside the cottage… that’s exactly what we needed for a relaxing holiday away from the city. Evening was spent exploring the surroundings. Small meandering path through fruit trees took us to the village. A small village with just a few houses with farms and the livestock. Just a kilometer away from the cottage was the local market. A short drive little further took us to Sitla from where we got a breathtakingly beautiful view of the Himalayan ranges – Trisul, Nandadevi and Panchachuli. There’s a shop here where you can buy locally made stuff that includes spreads, jams, juices, handicrafts etc. 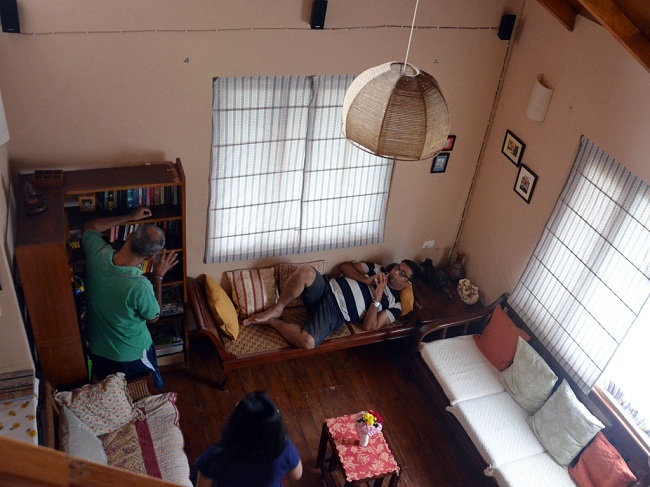 Once back to our nest, we picked our corners to just relax and soak in the serenity of the place. The music from the wind chyme was the only sound we could hear. 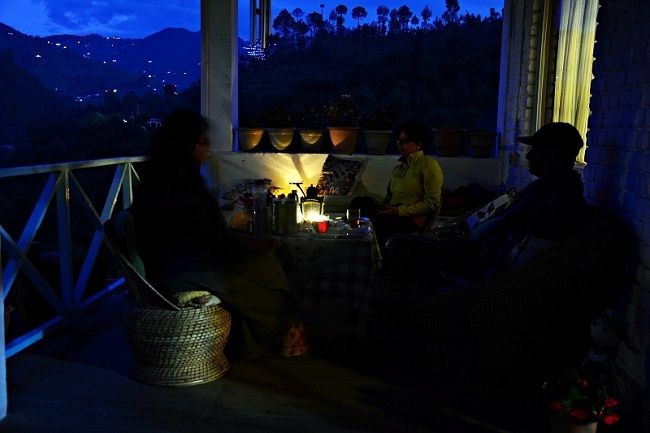 After a refreshing cup of tea, we all got together and enjoyed chatting in a cozy balcony lit by candle lamps creating a mystic effect. Had sumptuous dinner cooked and served with lots of care and love. The living area became our favorite place. The wide range of books and music collection, the wooden interior, cozy couches made it a place you would want to spend days relaxing at. Just a night was not at all sufficient. I woke up to chirping of a bird on the window sill of the attic I stayed at. It was very early in the morning. The same lazy me who would not get up early morning for anything in the city, was up and straight at 5.30 am with no intentions to go back to bed again. Sitting in the small sit-out area of the attic sipping my morning tea, I could see the forest slowly getting lit and the life getting started in the village. The deep breaths of cool fresh air refreshed my body and soul. I was rejuvenated to take on the stress of busy city life again. On Road: New Delhi to Nathuakhan: 340 kms via Moradabad, Rampur, Rudrapur, Haldwani, Kathgodam, Bhowali, Malla Ramgarh, Talla Ramgarh. The journey takes approximately 8 hours..
By Train: Ranikhet Express runs daily; Departure from Old Delhi at 10:40 PM, Arrival at Kathgodam at 5:20AM. Khatgodam AC Express runs on Wednesday, Friday and Sunday; Departure from Delhi Anand Vihar at 6:00 AM, Arrival at Kathgodam at 11:55 AM. Take a taxi from Kathgodam to Nathuakhan, a hill journey of 60 km.